In a medium bowl, whisk 1 1/2 tablespoons of the vinegar, the thyme, 3/4 teaspoon of the salt, and 1/8 teaspoon pepper. Add the olive oil slowly, whisking. Heat the oven to 350°. Cut the pork into 1/4-inch slices, and then cut the slices into 1/4-inch strips. In a large frying pan, heat 1 tablespoon of the cooking oil over high heat. Add half the pork, sprinkle with 1/4 teaspoon of the salt, and sauté until cooked through and just beginning to brown, 3 to 4 minutes. Remove. Heat the remaining 1 tablespoon cooking oil and cook the rest of the pork, seasoning it with the remaining 1/4 teaspoon salt. Return all the pork to the pan. Stir in the barbecue sauce, cumin, the remaining 1 tablespoon vinegar, and two thirds (about 1 cup) of the cheese. Spread some of the pork mixture in a line just below the center of each tortilla. 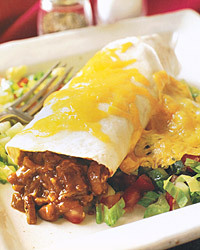 Roll up the burritos and put them seam-side down in a small baking dish. Bake for 10 minutes, sprinkle with the remaining cheese, and bake until the cheese melts and the filling is hot, about 2 minutes longer. Meanwhile, put the lettuce, tomatoes, bell peppers, and cucumber into the bowl and toss. Put the salad on plates and top with the burritos. With sweet, smoky-tasting barbecue, it's a toss-up between an exuberant Californian Zinfandel and a lush, jammy Australian Shiraz.